We’ve all been anxiously anticipating today’s Samsung Unpacked announcement in Barcelona, and it certainly did not disappoint. With a whirlwind of new add-ons to their latest Galaxy S5, Samsung knows what they’re doing—and they’re doing it well. It’s easier to use, and better to look at. 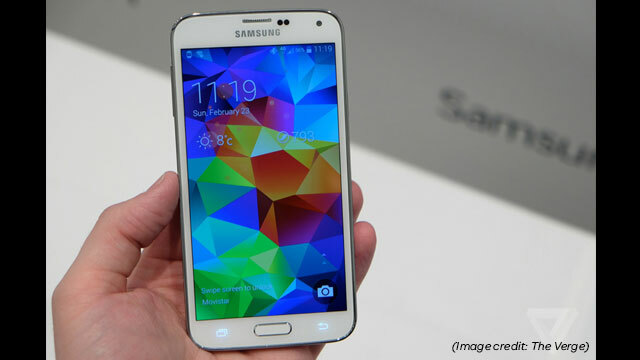 With a 5.1” display at 1080p, the new Samsung device features Android’s latest 4.4 KitKat operating system. The display actually auto adjusts its settings when indoors and outdoors—not just brightness, but color saturation and contrast, too. Engadget describes the device’s TouchWiz user interface as a “toned-down” version of what we’ve seen before, a welcomed change by Android fans. Simple or not, the 20% longer-lasting battery is sure to keep eyes glued to the Galaxy S5. It can compete with your expensive DSLR camera. Of all that was announced, Samsung may have been most proud of the latest Galaxy’s stunning camera features. A 16 megapixel sensor uses real-time HDR for that can be taken in 0.3 second shots, and that HDR also applies to its videos, which can now be shot in ultra-high definition. The Verge is a fan of the new camera effects you can apply later, “so you don’t have to worry about what mode you’re in when shooting pics.” And of course, the improved 2.1 megapixel front-facing camera makes for the perfect selfie. It’s got all of the “bells and whistles” consumers want. Dust and water resistance, a heart rate sensor for fit folks, and a fingerprint scanner that unlocks your phone OR a special data locker for files, passwords, and other confidential info—Samsung knew they would make a bang with improvements from the previous Galaxy S4’s features. But CNET wasn’t surprised, saying that as the top smartphone vendor in China, this is just one part of Samsung’s strategy to boost themselves as a consumer-centric brand. Did we mention that Speck already announced a line of striking, ultra-protective and durable Samsung Galaxy S5 cases coming out soon? Check out all of our Galaxy S5 cases here.